Though not quite as infamous as the 70th anniversary of Pearl Harbor, December 6, 2011 may be marked as a day of infamy for Canadian investors as it marked the last time the S&P/TSX Composite Index traded at a level above that of the Dow Jones Industrials Index. While the S&P/TSX has gained 12% over the past two years, its move has trailed the US benchmark, which has surged to new highs over the same period, gaining 34%. The widening market divergence has caused many to ask “what is wrong with Canada?” especially as our economy has been so resilient compared to that of the United States. What’s wrong with Canada? In two words, the answer is “cyclical stocks.” Relative to the US market, the weight of cyclical stocks in the Canadian market is substantially higher. As of November 2013, Canadian cyclical stocks, made up of stocks in the Energy and Materials sectors, accounted for 36% of the S&P/TSX. Canada has been, and most likely will always be, a cyclical market. Canada has been, and most likely will always be, a cyclical market. When investor expectations towards growth are favourable, our market tends to do better than that of our southern friends; the opposite is true when caution takes hold. 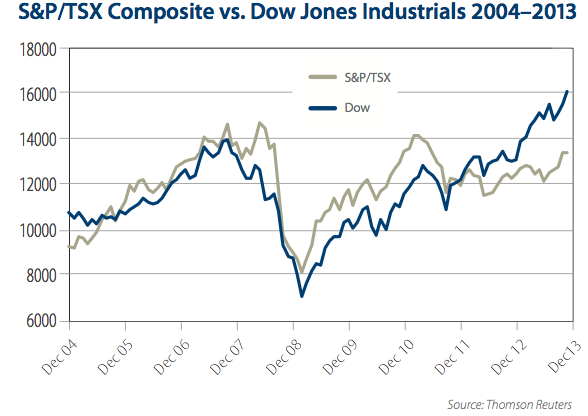 From 2003 to 2008, the S&P/TSX handily beat the Dow. The same held true from 1976 to 1992. Coming out of the market meltdown of 2008-09, the S&P/TSX rocketed ahead of the Dow, based primarily on the strength of our cyclical names. Since 2011, however, the market has taken a cautious view towards global growth, and as a result, our cyclical names and the commodities upon which they are dependent, have suffered. With the United States now showing sustained economic growth, Europe appearing to stabilize and China showing 7% growth, we continue to find value in the cyclical areas of the Canadian market. Cyclical companies which are on the low end of the commodity cost curve, possess strong balance sheets, and have management teams that have exhibited a shareholder-friendly approach to dividends, are appearing more and more on our valuation screens. As dividend-growth investors, our focus is less on markets and more on the individual stocks that make up our clients’ portfolios. Sector weights in our portfolios bear little resemblance to the sector weights in the broad market indices. Leon Frazer’s approach has always been to own a diversified balance of cyclical and non-cyclical holdings, recognizing that from time to time, one of the sectors may be in or out of favour. As long as the dividends are paid, and more importantly, growing, we will take the reward from our time in the market, and ignore the timing aspects of catching the trade of the day. By focusing on dividends, and compounding those portfolio dividends at higher yields than the S&P/TSX, LFA portfolios have benefited from our consistent style. The importance of dividends in the context of total portfolio returns should not be discounted. When dividends are considered, the Canadian market has matched the Dow since 2004! Time in the market continues to be our emphasis as opposed to timing the market.